Have you wondered why some sixty-year-olds look and feel like forty-year-olds and why some forty-year-olds look and feel like sixty-year-olds? While many factors contribute to aging and illness, Dr. Elizabeth Blackburn discovered a biological indicator called telomerase, the enzyme that replenishes telomeres, which protect our genetic heritage. Dr. Blackburn and Dr. Elissa Epel's research shows that the length and health of one's telomeres are a biological underpinning of the long-hypothesized mind-body connection. They and other scientists have found that changes we can make to our daily habits can protect our telomeres and increase our health spans (the number of years we remain healthy, active, and disease-free).THE TELOMERE EFFECT reveals how Blackburn and Epel's findings, together with research from colleagues around the world, cumulatively show that sleep quality, exercise, aspects of diet, and even certain chemicals profoundly affect our telomeres, and that chronic stress, negative thoughts, strained relationships, and even the wrong neighborhoods can eat away at them. Drawing from this scientific body of knowledge, they share lists of foods and suggest amounts and types of exercise that are healthy for our telomeres, mind tricks you can use to protect yourself from stress, and information about how to protect your children against developing shorter telomeres, from pregnancy through adolescence. And they describe how we can improve our health spans at the community level, with neighborhoods characterized by trust, green spaces, and safe streets. 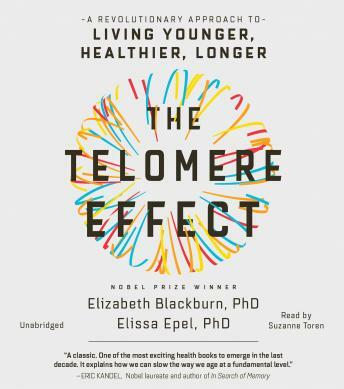 THE TELOMERE EFFECT will make you reassess how you live your life on a day-to-day basis. It is the first book to explain how we age at a cellular level and how we can make simple changes to keep our chromosomes and cells healthy, allowing us to stay disease-free longer and live more vital and meaningful lives. awesome and very informative book. recommended to many people. Live healthier, live longer. We are interconnected. Excellent. Informative. Intriguing well documented evidence. Great information, evidential support is wonderful too. Some bias of information can be found in the reading, a push of eugenic theory can be easily traced through some of the concepts. The information could be used to support ideas of selective breeding, eugenics, and victim-blaming. Pregnancy practices and genetic passing of stress - especially from those of lower economic status - can be an seen as a policy based agenda push of information to encourage regulatory practice like birth controls on Socio-economic factors, genetic modification/controls on disability/Socio-economic/other social factors. Book is presented in a self-help like reading, the information is well documented health nutrition based information just linking it to the actual cell discovery process of aging.